Lessons aboard an historic 32′ Friendship sloop—a traditional American sailing craft. Andy Zuber grew up sailing extensively along the Maine coast with his parents on the family’s 32′ Friendship sloop GLADIATOR. After high school graduation, he helped sail GLADIATOR as a charter vessel with his dad from 1987 through 1994 and obtained his USCG license during this same time. In 1991, he jumped at the opportunity to sail in the South Pacific from Tahiti to New Zealand by way of Tonga, an experience he thoroughly loved. He was even fortunate enough to sail on the Nile and Red Sea while stationed in Egypt as a U.S. Army physician assistant. Andy currently lives with his wife and children in Daytona Beach, Florida, and works in the city’s Emergency Department. GLADIATOR is a true original Friendship sloop built in 1902 in Bremen, Maine. Designed by Alexander McLain, she measures 32’ on deck, has an 11’ beam, and draws 6’. She fished in the Gulf of Maine until 1927 before being converted to a pleasure sailing craft. GLADIATOR then sailed in the Chesapeake region in the 30’s through the late 1960’s. 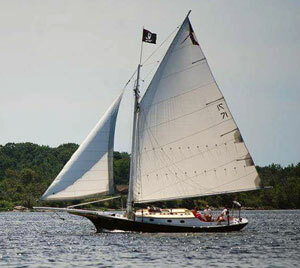 Bill Zuber then purchased her in 1967, brought her back to Friendship, Maine in 1972, and, along with his son, Andy, extensively rebuilt her from 1982-87. A distinguished member of the Friendship Sloop Society since 1967, GLADIATOR was won several Sloop Races, as well as The Chowder Cup and the Retired Skipper’s Race. Carrying nearly 1,200 ‘ of sail, she is a fun boat to sail and may be the perfect boat in which to gain a better understanding of the art of seamanship. One of the many interesting facts about the Friendship sloop is that it was originally a very popular and successful workboat in Maine waters and then, after disappearing for almost half a century, returned as a popular pleasure craft in the first decade of the 20th century. GLADIATOR was designed and built by Alexander McLain in 1902 in Bremen, Maine, and after years of service as a fishing boat and pleasure craft in Maine and Chesapeake Bay waters, she returned to Friendship, Maine, where she was extensively rebuilt by the Zuber family from 1982 to 1987. Since then, GLADIATOR has sailed a great deal of the Maine coast and raced successfully with the Friendship Sloop Society, winning many sailing regattas. With nearly 1,200’ of canvas, she provides a hearty taste of traditional seamanship for all who sail her. With plenty of lines and sails to handle, she has the feel of a real vessel under way and is fun to sail! During this five-day course, Capt. Andy Zuber will guide students through the lessons of handling a mid-sized sailboat. Each morning will begin with the crew meeting onboard to discuss the forecasted weather and sea conditions, winds and tide. Together, the goals of the day will be outlined along with a review of the previous day’s experiences. Then sails will be hoisted, and off you’ll go. Throughout the week, you will navigate and voyage to as many pristine destinations on local waters as we can squeeze in. The days will be filled with hands-on exercises including navigation, sail handling, lines and rigging, safety at sea, reefing, heaving-to, sailing off and up to moorings, and anchoring. And, yes, lots and lots of sailing! While under sail, you will be able to apply your small-boat sailing techniques and gain larger-boat sailing experience. As each day winds down, you’ll sail back to the school’s waterfront and bask in the rewards of spending an exciting day under a full spread of canvas on a beautiful, traditional sailing vessel.